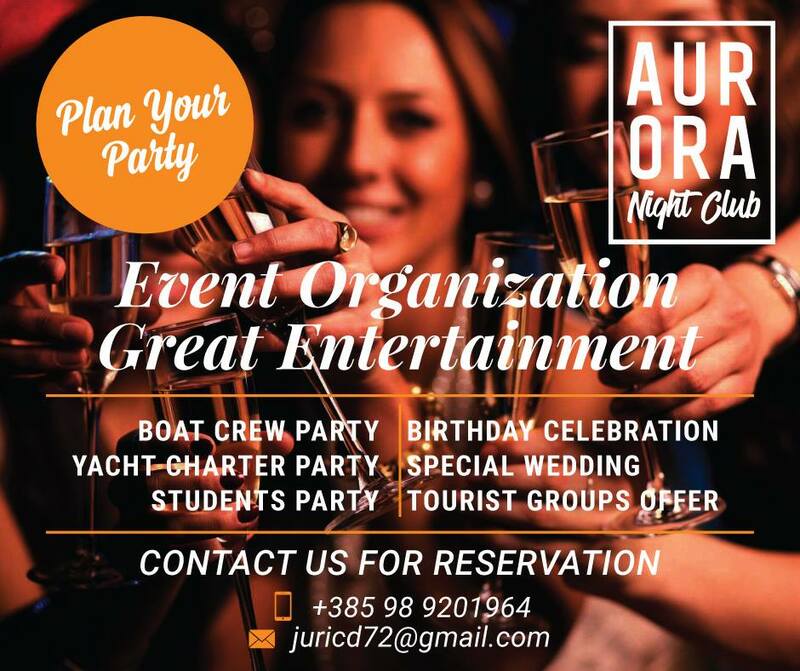 The Aurora Club is comprised of two different levels, including 2 dance floors, 5 bars, open air dance floor, swimming pool, VIP lounge, trendy Lounge room with pizzeria and steak house. Aurora club had its grand opening May 1st, 1991. 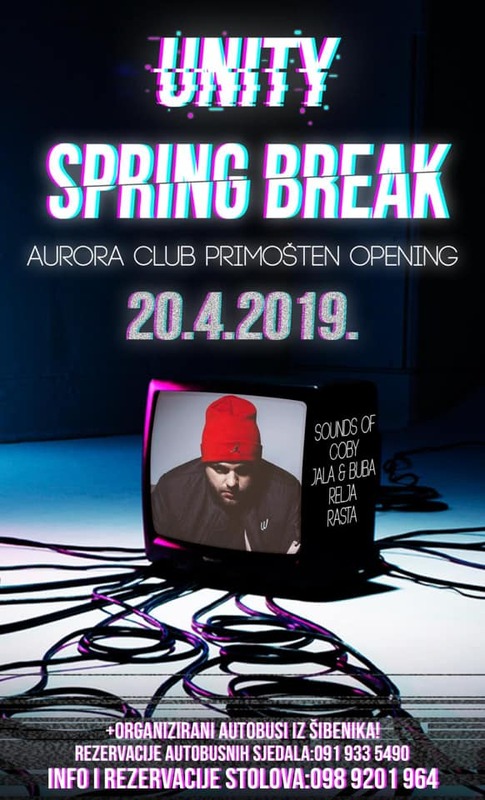 Aurora is one of Croatia’s largest and most famous club, one of the finest resorts on the Croatian coast, situated on the hills of the town of Primošten about 2 km from the central downtown area. It is built in the classical Mediterranean style and characteristic for its simplicity, bright colors, flat roofs, stone walls, terraces, swimming pool , gardens, palm trees and extravagant greenery. The club is open from June to September each year, in high season every night from middle of July till end of August. The Club is comprised of two different levels, including 2 dance floors, 5 bars, open air dance floor, swimming pool, vip lounge, trendy Lounge room with pizzeria and steak house. First level of Aurora is Ground floor made up of the lounge room and terrace open from 22h to 04h. with lounge music, contains: pizzeria-restaurant; cocktail bar; terace; biliards; dj box; video animation, fun games and billiard tables. Our restaurant offers a guaranteed harmony of taste and aroma based on a combination of local seasonal ingridients. Guests can experience an unforgettable offer, as well as good service which is provided by an international staff . A meal in the restaurant is a great way to start the evening, but don’t forget to book in advance, as it is always busy!!! Second level is first floor made up of the internal and exterior area open from 23h to 04h, with 2 dance floor, including a stage, bar and open air level made up of a terace, placed at the back of the club and beautifully decorated to give a warm domestic feeling. The terace contains a central dance floor and stage for live bands, a DJ box, 3 bars with a cocktail area, swimming pool and VIP lounge ! It’s considered one of the most important V.I.P room on the Croatian coast, as its dimension, quality and service. You can enjoy of this area of the club and feeling the same sensation as if you would be on the balcony of a very famous theatre.It’s the perfect place to celebrate your special days and enjoy it’s favorite dj’s. Let’s celebrate your birthday and any other kind of event. We accept any type of suggestion to make your night in Aurora unforgettable.There are 20 tables and a big cocktail bar. Every night during the summer, the garden is transformed into a themed wonderland with artistic decorations and visuals. The club is visited by famous guests from the world of show business, fashion and culture, but in particular by the people of Croatia itself. The music is programmed and played by many famous DJs and live bands, with different styles of music; funky, soul, pop, dance, jazz, hip hop, R&B, house, and more! The summer program varies each year but the choice of music covers all categories. The sound system is huge (20 kw) with a concentration of sound on the dance floors and satellite speakers that have been fitted to maintain the perfect level of sound no matter which part of the maze one may be in. Every year has seen some new change or alteration to the building, allowing it to be constantly dynamic and fashionable. This place is very hip. Two dance floors jam with some of Europe’s most talented DJs and bands – Aurora gives you the chance to have a good time in the ambience you prefer among our two different ambiences!! !